Why measure women's empowerment? What, broadly, has the Strategic Impact Inquiry on women's empowerment taught us to date? This document presents measurement of womens empowermtns and the strategic impact inquiry on women's empowerment. Across the entire spectrum of development work there is growing momentum around women's empowerment and its link to the fight against poverty. CARE has spent 10 years investing steadily in that area, but what exactly does CARE do to empower women? Does it work? How do we know? And does it really hold the key to overcoming poverty? 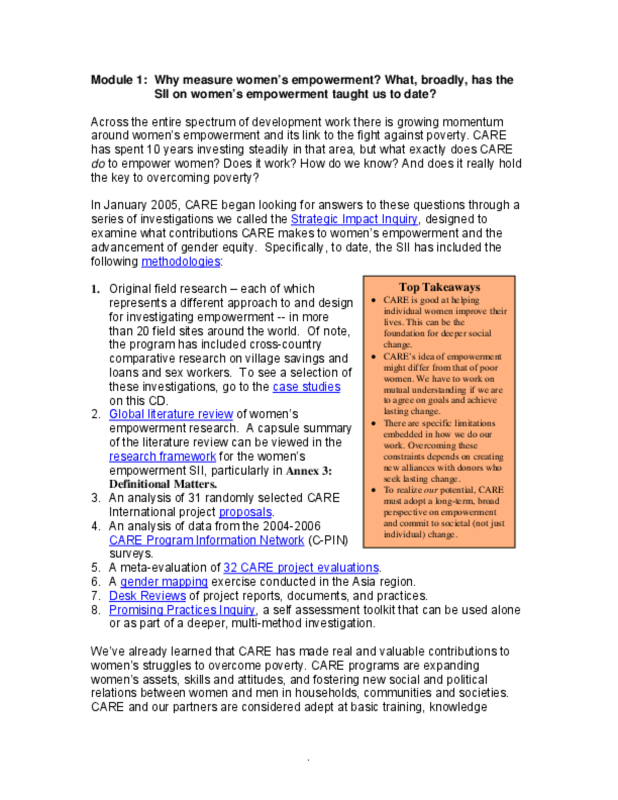 In January 2005, CARE began looking for answers to these questions through a series of investigations we called the Strategic Impact Inquiry, designed to examine what contributions CARE makes to women's empowerment and the advancement of gender equity. Title: Why measure women's empowerment? What, broadly, has the Strategic Impact Inquiry on women's empowerment taught us to date?